Jilin is part of ‘Manchuria’ the north-eastern region of China. The name ‘Jilin’ comes from the Manchu word for the Songhua river ‘Jilinwula’. It was part of the ancient Korean kingdom of Goguryeo ➚ before Jilin was conquered during the Chinese Han dynasty but was sparsely populated until the 19th century. 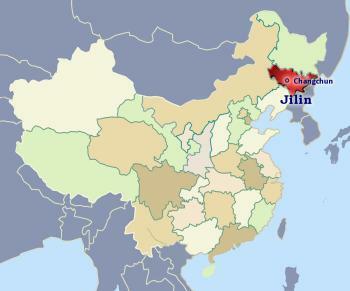 Jilin reached its greatest geographical extent during Qing dynasty times, the lands east of the Wusuli (Ussuri) River on the north Pacific were under its control, including Hǎishēnwǎi (Vladivostok) and even Sakhalin island to the north of Japan. These lands were given up to Russia in the Amur Annexation ➚ (1858-60). Rapid industrial development began under the Japanese occupation when it was part of the kingdom of Manchuguo (Manchukuo WG) 1933-45. Changchun, Jilin's largest industrial city, is famous for its car and truck factories. It has the former palace of the last Qing emperor Puyi who was set up as Manchuguo's ruler and is now a museum; at this time Changchun (meaning Eternal Spring) was known as ‘Xinjing’ (New Capital). The Buddhist Banruo Temple stands to the north-east of the center. Some of the central and University buildings date from the Japanese occupation. Image by Lzy881114 ➚ available under a Creative Commons license ➚. Jilin City to the east of Changchun is important for industry - three large chemical plants were built in 1949. It is also the site of the Wenmiao ➚ Confucian Temple. Beishan Park to the west of Jilin City has several temples. It has a notable Catholic church. Perhaps its most unusual attraction is a Meteorite Museum that houses fragments of a meteorite that fell in 1976, some fragments weigh 2 tons [1,814 kgs]. The ski resort at Songhua Lake attests to the cold winter weather in the province. It is also renowned for the frost covered trees which are produced when ice droplets form from the mist (called shugua) created by a nearby hydro-electric plant. Ji'an on the Yalu River was the capital of the Korean Goguryeo kingdom and is now the border crossing into North Korea. There are tombs and other remains as evidence of the old Korean kingdom and ethnic Korean people predominate. The General's Tomb ➚ at Ji'an is a monument dating to the Han dynasty. Lake Tian (Heavenly Lake) is a scenic spot in the far south. It is an old volcanic crater lake and straddles the border of Jilin with North Korea. The Longtan Deer farm ➚ is a popular tourist attraction nearby. Tianchi is within the Changbai (forever white) mountain range which has thick snow cover in winter. The mountainous terrain and forests are still home to snow leopards and tigers. This area produces considerable quantities of the medicinal herb ginseng. The mountainous south eastern region that borders North Korea is home to a high proportion of Korean ethnic people. Jilin province has a very cold winter climate but in the north-west lies a plain of rich agricultural land producing much corn and soy beans. It also has fine pasture for sheep and cattle. Around Tonghua in the south east the mountains provide ideal conditions for growing vines. 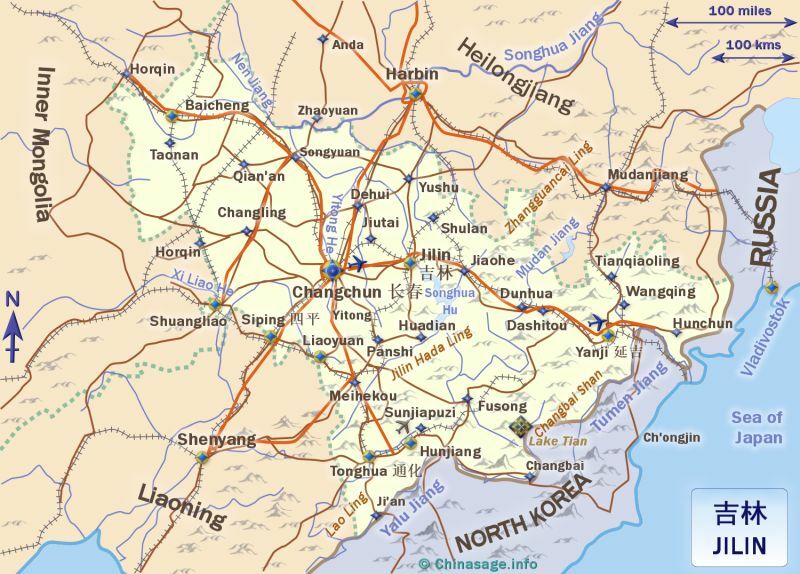 Citation information for this page : Chinasage, 'Jilin Province in Northern China', last updated 27 Nov 2018, Web, http://www.chinasage.info/maps/jilin.htm.